As of June 30, 2018 the aggregate market value of voting stock held by non-affiliates of the registrant, based upon the closing sales price for the registrant’s common stock, as reported in the NASDAQ Global Select Market System, was $148,681,810,838. Shares of common stock beneficially owned by each executive officer and director of the Registrant and by each person known by the Registrant to beneficially own 10% or more of the outstanding common stock have been excluded in that such persons may be deemed to be affiliates. This determination of affiliate status is not necessarily a conclusive determination for any other purpose. As of December 31, 2018, there were 436,598,597 shares of the registrant’s common stock, par value $0.001, outstanding. Parts of the registrant’s Proxy Statement for Registrant’s 2019 Annual Meeting of Stockholders are incorporated by reference into Part III of this Annual Report on Form 10-K. This Annual Report on Form 10-K contains forward-looking statements within the meaning of the federal securities laws. These forward-looking statements include, but are not limited to, statements regarding: our core strategy; operating income and margin; seasonality; contribution margins; contribution profits (losses); liquidity, including cash flows from operations, available funds and access to financing sources; free cash flows; revenues; net income; profitability; stock price volatility; impact of foreign exchange; adequacy of existing office space; paid memberships as indicator of growth; the decline in our DVD memberships; pricing changes; the impact of, and the company's response to new accounting standards; action by competitors; membership growth; partnerships; member viewing patterns; payment of future dividends; obtaining additional capital, including use of the debt market; future obligations; our content and marketing investments, including investments in original programming; amortization; significance and timing of contractual obligations; tax expense; recognition of unrecognized tax benefits; and realization of deferred tax assets. These forward-looking statements are subject to risks and uncertainties that could cause actual results and events to differ. A detailed discussion of these and other risks and uncertainties that could cause actual results and events to differ materially from such forward-looking statements is included throughout this filing and particularly in Item 1A: "Risk Factors" section set forth in this Annual Report on Form 10-K. All forward-looking statements included in this document are based on information available to us on the date hereof, and we assume no obligation to revise or publicly release any revision to any such forward-looking statement, except as may otherwise be required by law. Netflix, Inc. (“Netflix”, “the Company”, “we”, or “us”) is the world’s leading internet entertainment service with over 139 million paid memberships in over 190 countries enjoying TV series, documentaries and feature films across a wide variety of genres and languages. Members can watch as much as they want, anytime, anywhere, on any internet-connected screen. Members can play, pause and resume watching, all without commercials or commitments. Additionally, over two million members in the United States ("U.S.") subscribe to our legacy DVD-by-mail service. We are a pioneer in the internet delivery of TV series and movies, launching our streaming service in 2007. Since this launch, we have developed an ecosystem for internet-connected screens and have added increasing amounts of content that enable consumers to enjoy TV series and movies directly on their internet-connected screens. As a result of these efforts, we have experienced growing consumer acceptance of, and interest in, the delivery of TV series and movies directly over the internet. Our core strategy is to grow our streaming membership business globally within the parameters of our operating margin target. We are continuously improving our members' experience by expanding our streaming content with a focus on a programming mix of content that delights our members and attracts new members. In addition, we are continuously enhancing our user interface and extending our streaming service to more internet-connected screens. Our members can download a selection of titles for offline viewing. The Company has three reportable segments: Domestic streaming, International streaming and Domestic DVD. The Domestic streaming segment derives revenues from monthly membership fees for services related to streaming content to members in the United States. The International streaming segment derives revenues from monthly membership fees for services related to streaming content to members outside of the United States. The Domestic DVD segment derives revenues from monthly membership fees for services consisting solely of DVD-by-mail. The market for entertainment video is intensely competitive and subject to rapid change. We compete against other entertainment video providers, such as multichannel video programming distributors ("MVPDs"), internet-based content providers (including those that provide pirated content), video gaming providers and DVD retailers and more broadly against other sources of entertainment that our members could choose in their moments of free time. We also compete against entertainment video providers and content producers in obtaining content for our service, both for licensed streaming content and for original content projects. truth." In attempting to win these moments of truth with our members, we are continually improving our service, including both our technology and our content, which is increasingly exclusive and curated, and includes our own original programming. Our membership growth exhibits a seasonal pattern that reflects variations when consumers buy internet-connected screens and when they tend to increase their viewing. Historically, the first and fourth quarters (October through March) represent our greatest membership growth across our Domestic and International streaming segments. Our membership growth can sometimes be impacted by the release of certain high-profile original content. Within our International streaming segment, we expect each market to demonstrate more predictable seasonal patterns as our service offering in each market becomes more established and we have a longer history to assess such patterns. As of December 31, 2018, we had approximately 7,100 full-time employees, of which approximately 6,900 supported our streaming segments. We maintain a website at www.netflix.com. The contents of our website are not incorporated in, or otherwise to be regarded as part of, this Annual Report on Form 10-K. In this Annual Report on Form 10-K, “Netflix,” the “Company,” “we,” “us,” “our” and the “registrant” refer to Netflix, Inc. We make available, free of charge on our website, access to our Annual Report on Form 10-K, our Quarterly Reports on Form 10-Q, our Current Reports on Form 8-K and amendments to those reports filed or furnished pursuant to Section 13(a) or 15(d) of the Securities Exchange Act of 1934, as amended (the "Exchange Act"), as soon as reasonably practicable after we file or furnish them electronically with the Securities and Exchange Commission ("SEC"). We have experienced significant membership growth over the past several years. Our ability to continue to attract members will depend in part on our ability to consistently provide our members with compelling content choices, as well as a quality experience for selecting and viewing TV series and movies. Furthermore, the relative service levels, content offerings, pricing and related features of competitors to our service may adversely impact our ability to attract and retain memberships. Competitors include other entertainment video providers, such as MVPDs, internet-based movie and TV content providers (including those that provide pirated content) and DVD retailers. If consumers do not perceive our service offering to be of value, including if we introduce new or adjust existing features, adjust pricing or service offerings, or change the mix of content in a manner that is not favorably received by them, we may not be able to attract and retain members. In addition, many of our members rejoin our service or originate from word-of-mouth advertising from existing members. If our efforts to satisfy our existing members are not successful, we may not be able to attract members, and as a result, our ability to maintain and/or grow our business will be adversely affected. Members cancel our service for many reasons, including a perception that they do not use the service sufficiently, the need to cut household expenses, availability of content is unsatisfactory, competitive services provide a better value or experience and customer service issues are not satisfactorily resolved. We must continually add new memberships both to replace canceled memberships and to grow our business beyond our current membership base. If we do not grow as expected, given, in particular, that our content costs are largely fixed in nature and contracted over several years, we may not be able to adjust our expenditures or increase our (per membership) revenues commensurate with the lowered growth rate such that our margins, liquidity and results of operation may be adversely impacted. If we are unable to successfully compete with current and new competitors in both retaining our existing memberships and attracting new memberships, our business will be adversely affected. Further, if excessive numbers of members cancel our service, we may be required to incur significantly higher marketing expenditures than we currently anticipate to replace these members with new members. The market for entertainment video is intensely competitive and subject to rapid change. Through new and existing distribution channels, consumers have increasing options to access entertainment video. The various economic models underlying these channels include subscription, transactional, ad-supported and piracy-based models. All of these have the potential to capture meaningful segments of the entertainment video market. Piracy, in particular, threatens to damage our business, as its fundamental proposition to consumers is so compelling and difficult to compete against: virtually all content for free. Furthermore, in light of the compelling consumer proposition, piracy services are subject to rapid global growth. Traditional providers of entertainment video, including broadcasters and cable network operators, as well as internet based e-commerce or entertainment video providers are increasing their internet-based video offerings. Several of these competitors have long operating histories, large customer bases, strong brand recognition, exclusive rights to certain content and significant financial, marketing and other resources. They may secure better terms from suppliers, adopt more aggressive pricing and devote more resources to product development, technology, infrastructure, content acquisitions and marketing. New entrants may enter the market or existing providers may adjust their services with unique offerings or approaches to providing entertainment video. Companies also may enter into business combinations or alliances that strengthen their competitive positions. If we are unable to successfully or profitably compete with current and new competitors, our business will be adversely affected, and we may not be able to increase or maintain market share, revenues or profitability. Item 7, "Management's Discussion and Analysis of Financial Condition and Results of Operations" and Note 5, Commitments and Contingencies in the accompanying notes to our consolidated financial statements included in Part II, Item 8, "Financial Statements and Supplementary Data" of this Annual Report on Form 10-K. Given the multiple-year duration and largely fixed cost nature of content commitments, if membership acquisition and retention do not meet our expectations, our margins may be adversely impacted. Payment terms for certain content commitments, such as content we directly produce, will typically require more up-front cash payments than other content licenses or arrangements whereby we do not cashflow the production of such content. To the extent membership and/or revenue growth do not meet our expectations, our liquidity and results of operations could be adversely affected as a result of content commitments and accelerated payment requirements of certain agreements. In addition, the long-term and fixed cost nature of our content commitments may limit our flexibility in planning for, or reacting to changes in our business and the market segments in which we operate. If we license and/or produce content that is not favorably received by consumers in a territory, or is unable to be shown in a territory, acquisition and retention may be adversely impacted and given the long-term and fixed cost nature of our content commitments, we may not be able to adjust our content offering quickly and our results of operation may be adversely impacted. As a producer and distributor of content, we face potential liability for negligence, copyright and trademark infringement, or other claims based on the nature and content of materials that we acquire, produce, license and/or distribute. We also may face potential liability for content used in promoting our service, including marketing materials. We are devoting more resources toward the development, production, marketing and distribution of original programming, including TV series and movies. We believe that original programming can help differentiate our service from other offerings, enhance our brand and otherwise attract and retain members. To the extent our original programming does not meet our expectations, in particular, in terms of costs, viewing and popularity, our business, including our brand and results of operations may be adversely impacted. As we expand our original programming, we have become responsible for production costs and other expenses, such as ongoing guild payments. We also take on risks associated with production, such as completion and key talent risk. Negotiations or renewals related to entertainment industry collective bargaining agreements could negatively impact timing and costs associated with our productions. We contract with third parties related to the development, production, marketing and distribution of our original programming. We may face potential liability or may suffer losses in connection with these arrangements, including but not limited to if such third parties violate applicable law, become insolvent or engage in fraudulent behavior. To the extent we create and sell physical or digital merchandise relating to our original programming, and/or license such rights to third parties, we could become subject to product liability, intellectual property or other claims related to such merchandise. We may decide to remove content from our service, not to place licensed or produced content on our service or discontinue or alter production of original content if we believe such content might not be well received by our members or could be damaging to our brand or business. To the extent we do not accurately anticipate costs or mitigate risks, including for content that we obtain but ultimately does not appear on or is removed from our service, or if we become liable for content we acquire, produce, license and/or distribute, our business may suffer. Litigation to defend these claims could be costly and the expenses and damages arising from any liability or unforeseen production risks could harm our results of operations. We may not be indemnified against claims or costs of these types and we may not have insurance coverage for these types of claims. Our ability to provide our members with content they can watch depends on studios, content providers and other rights holders licensing rights to distribute such content and certain related elements thereof, such as the public performance of music contained within the content we distribute. The license periods and the terms and conditions of such licenses vary. As content providers develop their own streaming services, they may be unwilling to provide us with access to certain content, including popular series or movies. If the studios, content providers and other rights holders are not or are no longer willing or able to license us content upon terms acceptable to us, our ability to stream content to our members will be adversely affected and/or our costs could increase. Certain licenses for content provide for the studios or other content providers to withdraw content from our service relatively quickly. Because of these provisions as well as other actions we may take, content available through our service can be withdrawn on short notice. As competition increases, we may see the cost of programming increase. As we seek to differentiate our service, we are increasingly focused on securing certain exclusive rights when obtaining content, including original content. We are also focused on programming an overall mix of content that delights our members in a cost efficient manner. Within this context, we are selective about the titles we add and renew to our service. If we do not maintain a compelling mix of content, our membership acquisition and retention may be adversely affected. rights to music and/or other interests in connection with streaming content into various territories. If we are unable to reach mutually acceptable terms with these organizations, we could become involved in litigation and/or could be enjoined from distributing certain content, which could adversely impact our business. Additionally, pending and ongoing litigation as well as negotiations between certain CMOs and other third parties in various territories could adversely impact our negotiations with CMOs, or result in music publishers represented by certain CMOs unilaterally withdrawing rights, and thereby adversely impact our ability to reach licensing agreements reasonably acceptable to us. Failure to reach such licensing agreements could expose us to potential liability for copyright infringement or otherwise increase our costs. Additionally, as the market for the digital distribution of content grows, a broader role for CMOs in the remuneration of authors and performers could expose us to greater distribution expenses. We are expanding our operations internationally, scaling our streaming service to effectively and reliably handle anticipated growth in both members and features related to our service, ramping up our ability to produce original content, as well as continuing to operate our DVD service within the U.S. As our international offering evolves, we are managing and adjusting our business to address varied content offerings, consumer customs and practices, in particular those dealing with e-commerce and internet video, as well as differing legal and regulatory environments. As we scale our streaming service, we are developing technology and utilizing third-party “cloud” computing services. As we ramp up our original content production, we are building out expertise in a number of disciplines, including creative, marketing, legal, finance, licensing, merchandising and other resources related to the development and physical production of content. If we are not able to manage the growing complexity of our business, including improving, refining or revising our systems and operational practices related to our streaming operations and original content, our business may be adversely affected. implementation of regulations designed to stimulate the local production of film and TV series in order to promote and preserve local culture and economic activity, including local content quotas, investment obligations, and levies to support local film funds. If we fail to maintain or, in newer markets establish, a positive reputation concerning our service, including the content we offer, we may not be able to attract or retain members, and our operating results may be adversely affected. We believe that a positive reputation concerning our service is important in attracting and retaining members. To the extent our content, in particular, our original programming, is perceived as low quality, offensive or otherwise not compelling to consumers, our ability to establish and maintain a positive reputation may be adversely impacted. To the extent our content is deemed controversial or offensive by government regulators, we may face direct or indirect retaliatory action or behavior, including being required to remove such content from our service, our entire service could be banned and/or become subject to heightened regulatory scrutiny across our business and operations. Furthermore, to the extent our marketing, customer service and public relations efforts are not effective or result in negative reaction, our ability to establish and maintain a positive reputation may likewise be adversely impacted. With newer markets, we also need to establish our reputation with consumers and to the extent we are not successful in creating positive impressions, our business in these newer markets may be adversely impacted. We utilize a broad mix of marketing and public relations programs, including social media sites, to promote our service to potential new members. We may limit or discontinue use or support of certain marketing sources or activities if advertising rates increase or if we become concerned that members or potential members deem certain marketing platforms or practices intrusive or damaging to our brand. If the available marketing channels are curtailed, our ability to attract new members may be adversely affected. Companies that promote our service may decide that we negatively impact their business or may make business decisions that in turn negatively impact us. For example, if they decide that they want to compete more directly with us, enter a similar business or exclusively support our competitors, we may no longer have access to their marketing channels. We also acquire a number of members who rejoin our service having previously cancelled their membership. If we are unable to maintain or replace our sources of members with similarly effective sources, or if the cost of our existing sources increases, our member levels and marketing expenses may be adversely affected. We utilize marketing to promote our content and drive viewing by our members. To the extent we promote our content inefficiently or ineffectively, we may not obtain the expected acquisition and retention benefits and our business may be adversely affected. We currently offer members the ability to receive streaming content through a host of internet-connected screens, including TVs, digital video players, television set-top boxes and mobile devices. We have agreements with various cable, satellite and telecommunications operators to make our service available through the television set-top boxes of these service providers. In many instances, our agreements also include provisions by which the partner bills consumers directly for the Netflix service or otherwise offers services or products in connection with offering our service. We intend to continue to broaden our relationships with existing partners and to increase our capability to stream TV series and movies to other platforms and partners over time. If we are not successful in maintaining existing and creating new relationships, or if we encounter technological, content licensing, regulatory, business or other impediments to delivering our streaming content to our members via these devices, our ability to retain members and grow our business could be adversely impacted. Our agreements with our partners are typically between one and three years in duration and our business could be adversely affected if, upon expiration, a number of our partners do not continue to provide access to our service or are unwilling to do so on terms acceptable to us, which terms may include the degree of accessibility and prominence of our service. Furthermore, devices are manufactured and sold by entities other than Netflix and while these entities should be responsible for the devices’ performance, the connection between these devices and Netflix may nonetheless result in consumer dissatisfaction toward Netflix and such dissatisfaction could result in claims against us or otherwise adversely impact our business. In addition, technology changes to our streaming functionality may require that partners update their devices. If partners do not update or otherwise modify their devices, our service and our members' use and enjoyment could be negatively impacted. Our computer systems and those of third parties we use in our operations are subject to cybersecurity threats, including cyber-attacks, both from state-sponsored and individual activity, such as computer viruses, denial of service attacks, physical or electronic break-ins and similar disruptions. These systems periodically experience directed attacks intended to lead to interruptions and delays in our service and operations as well as loss, misuse or theft of data, confidential information or intellectual property. Additionally, outside parties may attempt to fraudulently induce employees or users to disclose sensitive or confidential information in order to gain access to data. Any attempt by hackers to obtain our data (including member and corporate information) or intellectual property (including digital content assets), disrupt our service, or otherwise access our systems, or those of third parties we use, if successful, could harm our business, be expensive to remedy and damage our reputation. We have implemented certain systems and processes to thwart hackers and protect our data and systems, but techniques used to gain unauthorized access to data and software are constantly evolving, and we may be unable to anticipate or prevent unauthorized access. Because of our prominence, we (and/or third parties we use) may be a particularly attractive target for such attacks, and from time to time, we have experienced an unauthorized release of certain digital content assets. However, to date these unauthorized releases have not had a material impact on our service or systems. There is no assurance that hackers may not have a material impact on our service or systems in the future. Our insurance does not cover expenses related to such disruptions or unauthorized access. Efforts to prevent hackers from disrupting our service or otherwise accessing our systems are expensive to develop, implement and maintain. These efforts require ongoing monitoring and updating as technologies change and efforts to overcome security measures become more sophisticated, and may limit the functionality of or otherwise negatively impact our service offering and systems. Any significant disruption to our service or access to our systems could result in a loss of memberships and adversely affect our business and results of operation. Further, a penetration of our systems or a third-party’s systems or other misappropriation or misuse of personal information could subject us to business, regulatory, litigation and reputation risk, which could have a negative effect on our business, financial condition and results of operations. We utilize our own communications and computer hardware systems located either in our facilities or in that of a third-party Web hosting provider. In addition, we utilize third-party “cloud” computing services in connection with our business operations. We also utilize our own and third-party content delivery networks to help us stream TV series and movies in high volume to Netflix members over the internet. Problems faced by us or our third-party Web hosting, “cloud” computing, or other network providers, including technological or business-related disruptions, as well as cybersecurity threats and regulatory interference, could adversely impact the experience of our members. Amazon Web Services (“AWS”) provides a distributed computing infrastructure platform for business operations, or what is commonly referred to as a "cloud" computing service. We have architected our software and computer systems so as to utilize data processing, storage capabilities and other services provided by AWS. Currently, we run the vast majority of our computing on AWS. Given this, along with the fact that we cannot easily switch our AWS operations to another cloud provider, any disruption of or interference with our use of AWS would impact our operations and our business would be adversely impacted. While the retail side of Amazon competes with us, we do not believe that Amazon will use the AWS operation in such a manner as to gain competitive advantage against our service, although if it was to do so it could harm our business. We utilize a combination of proprietary and third-party technology to operate our business. This includes the technology that we have developed to recommend and merchandise content to our consumers as well as enable fast and efficient delivery of content to our members and their various consumer electronic devices. For example, we have built and deployed our own content-delivery network (“CDN”). To the extent Internet Service Providers (“ISPs”) do not interconnect with our CDN, or if we experience difficulties in its operation, our ability to efficiently and effectively deliver our streaming content to our members could be adversely impacted and our business and results of operation could be adversely affected. Likewise, if our recommendation and merchandising technology does not enable us to predict and recommend titles that our members will enjoy, our ability to attract and retain members may be adversely affected. We also utilize third-party technology to help market our service, process payments, and otherwise manage the daily operations of our business. If our technology or that of third-parties we utilize in our operations fails or otherwise operates improperly, including as a result of “bugs” in our development and deployment of software, our ability to operate our service, retain existing members and add new members may be impaired. Any harm to our members’ personal computers or other devices caused by software used in our operations could have an adverse effect on our business, results of operations and financial condition. The adoption or modification of laws or regulations relating to the internet or other areas of our business could limit or otherwise adversely affect the manner in which we currently conduct our business. As our service and others like us gain traction in international markets, governments are increasingly looking to introduce new or extend legacy regulations to these services, in particular those related to broadcast media and tax. For example, recent changes to European law enables individual member states to impose levies and other financial obligations on media operators located outside their jurisdiction. In addition, the continued growth and development of the market for online commerce may lead to more stringent consumer protection laws, which may impose additional burdens on us. If we are required to comply with new regulations or legislation or new interpretations of existing regulations or legislation, this compliance could cause us to incur additional expenses or alter our business model. Changes in laws or regulations that adversely affect the growth, popularity or use of the internet, including laws impacting net neutrality, could decrease the demand for our service and increase our cost of doing business. Certain laws intended to prevent network operators from discriminating against the legal traffic that traverse their networks have been implemented in many countries, including across the European Union. In others, the laws may be nascent or non-existent. Furthermore, favorable laws may change, including for example, in the United States where net neutrality regulations were repealed. Given uncertainty around these rules, including changing interpretations, amendments or repeal, coupled with potentially significant political and economic power of local network operators, we could experience discriminatory or anti-competitive practices that could impede our growth, cause us to incur additional expense or otherwise negatively affect our business. Most network operators that provide consumers with access to the internet also provide these consumers with multichannel video programming. As such, many network operators have an incentive to use their network infrastructure in a manner adverse to our continued growth and success. While we believe that consumer demand, regulatory oversight and competition will help check these incentives, to the extent that network operators are able to provide preferential treatment to their data as opposed to ours or otherwise implement discriminatory network management practices, our business could be negatively impacted. The extent to which these incentives limit operator behavior differs across markets. In the ordinary course of business and in particular in connection with content acquisition and merchandising our service to our members, we collect and utilize data supplied by our members. We currently face certain legal obligations regarding the manner in which we treat such information, including but not limited to Regulation (EU) 2016/679 (also known as the General Data Protection Regulation or “GDPR”). Other businesses have been criticized by privacy groups and governmental bodies for attempts to link personal identities and other information to data collected on the internet regarding users’ browsing and other habits. Increased regulation of data utilization practices, including self-regulation or findings under existing laws that limit our ability to collect, transfer and use data, could have an adverse effect on our business. In addition, if we were to disclose data about our members in a manner that was objectionable to them, our business reputation could be adversely affected, and we could face potential legal claims that could impact our operating results. Internationally, we may become subject to additional and/or more stringent legal obligations concerning our treatment of customer and other personal information, such as laws regarding data localization and/or restrictions on data export. Failure to comply with these obligations could subject us to liability, and to the extent that we need to alter our business model or practices to adapt to these obligations, we could incur additional expenses. We maintain personal data regarding our members, including names and billing data. This data is maintained on our own systems as well as that of third parties we use in our operations. With respect to billing data, such as credit card numbers, we rely on encryption and authentication technology to secure such information. We take measures to protect against unauthorized intrusion into our members’ data. Despite these measures we, our payment processing services or other third-party services we use such as AWS, could experience an unauthorized intrusion into our members’ data. In the event of such a breach, current and potential members may become unwilling to provide the information to us necessary for them to remain or become members. We also may be required to notify regulators about any actual or perceived data breach (including the EU Lead Data Protection Authority) as well as the individuals who are affected by the incident within strict time periods. Additionally, we could face legal claims or regulatory fines or penalties for such a breach. The costs relating to any data breach could be material, and we currently do not carry insurance against the risk of a data breach. We also maintain employment and personal information concerning our employees, as well as personal information of others working on our productions. Should an unauthorized intrusion into our members’ or employees’ data occur, our business could be adversely affected and our larger reputation with respect to data protection could be negatively impacted. leverage third parties such as our cable and other partners to bill subscribers on our behalf. If these third parties become unwilling or unable to continue processing payments on our behalf, we would have to transition subscribers or otherwise find alternative methods of collecting payments, which could adversely impact member acquisition and retention. In addition, from time to time, we encounter fraudulent use of payment methods, which could impact our results of operations and if not adequately controlled and managed could create negative consumer perceptions of our service. If we are unable to maintain our chargeback rate at acceptable levels, card networks may impose fines and our card approval rate may be impacted. The termination of our ability to process payments on any major payment method would significantly impair our ability to operate our business. We rely and expect to continue to rely on a combination of confidentiality and license agreements with our employees, consultants and third parties with whom we have relationships, as well as trademark, copyright, patent and trade secret protection laws, to protect our proprietary rights. We may also seek to enforce our proprietary rights through court proceedings or other legal actions. We have filed and we expect to file from time to time for trademark and patent applications. Nevertheless, these applications may not be approved, third parties may challenge any copyrights, patents or trademarks issued to or held by us, third parties may knowingly or unknowingly infringe our intellectual property rights, and we may not be able to prevent infringement or misappropriation without substantial expense to us. If the protection of our intellectual property rights is inadequate to prevent use or misappropriation by third parties, the value of our brand, content, and other intangible assets may be diminished, competitors may be able to more effectively mimic our service and methods of operations, the perception of our business and service to members and potential members may become confused in the marketplace, and our ability to attract members may be adversely affected. Intellectual property claims against us could be costly and result in the loss of significant rights related to, among other things, our website, streaming technology, our recommendation and merchandising technology, title selection processes and marketing activities. Trademark, copyright, patent and other intellectual property rights are important to us and other companies. Our intellectual property rights extend to our technology, business processes and the content we produce and distribute through our our service. We use the intellectual property of third parties in creating some of our content, merchandising our products and marketing our service. From time to time, third parties allege that we have violated their intellectual property rights. If we are unable to obtain sufficient rights, successfully defend our use, or develop non-infringing technology or otherwise alter our business practices on a timely basis in response to claims against us for infringement, misappropriation, misuse or other violation of third-party intellectual property rights, our business and competitive position may be adversely affected. Many companies are devoting significant resources to developing patents that could potentially affect many aspects of our business. There are numerous patents that broadly claim means and methods of conducting business on the internet. We have not searched patents relative to our technology. Defending ourselves against intellectual property claims, whether they are with or without merit or are determined in our favor, results in costly litigation and diversion of technical and management personnel. It also may result in our inability to use our current website, streaming technology, our recommendation and merchandising technology or inability to market our service or merchandise our products. We may also have to remove content from our service, or remove consumer products or marketing materials from the marketplace. As a result of a dispute, we may have to develop non-infringing technology, enter into royalty or licensing agreements, adjust our content, merchandising or marketing activities or take other actions to resolve the claims. These actions, if required, may be costly or unavailable on terms acceptable to us. also from time to time receive inquiries and subpoenas and other types of information requests from government authorities and we may become subject to related claims and other actions related to our business activities. While the ultimate outcome of investigations, inquiries, information requests and related legal proceedings is difficult to predict, such matters can be expensive, time-consuming and distracting, and adverse resolutions or settlements of those matters may result in, among other things, modification of our business practices, reputational harm or costs and significant payments, any of which could negatively affect our business operations and financial position. From time to time, we may seek to obtain additional capital, either through equity, equity-linked or debt securities. Our cash flows provided by our operating activities have been negative in each of the last four years, primarily as a result of our decision to increase the amount of original streaming content available on our service. To the extent our cash flows from operations continue to be negative, we anticipate seeking additional capital. The decision to obtain additional capital will depend on, among other things, our business plans, operating performance and condition of the capital markets. If we raise additional funds through the issuance of equity, equity-linked or debt securities, those securities may have rights, preferences or privileges senior to the rights of our common stock, and our stockholders may experience dilution. Any large equity or equity-linked offering could also negatively impact our stock price. increase our vulnerability to the impact of adverse economic and industry conditions, including changes in interest rates. Our streaming obligations include large multi-year commitments. As a result, we may be unable to react to any downturn in the economy or reduction in our cash flows from operations by reducing our streaming content obligations in the near-term. This could result in our needing to access the capital markets at an unfavorable time, which may negatively impact our stock price. and other factors beyond our control. In each of the last four years, our cash flows from operating activities have been negative. We may be unable to attain a level of cash flows from operating activities sufficient to permit us to pay the principal, premium, if any, and interest on our debt, including the Notes, and other obligations, including amounts due under our streaming content obligations. If we are unable to service our debt and other obligations from cash flows, we may need to refinance or restructure all or a portion of such obligations prior to maturity. Our ability to refinance or restructure our debt and other obligations will depend upon the condition of the capital markets and our financial condition at such time. Any refinancing or restructuring could be at higher interest rates and may require us to comply with more onerous covenants, which could further restrict our business operations. If our cash flows are insufficient to service our debt and other obligations, we may not be able to refinance or restructure any of these obligations on commercially reasonable terms or at all and any refinancing or restructuring could have a material adverse effect on our business, results of operations, or financial condition. If our cash flows are insufficient to fund our debt and other obligations and we are unable to refinance or restructure these obligations, we could face substantial liquidity problems and may be forced to reduce or delay investments and capital expenditures, or to sell material assets or operations to meet our debt and other obligations. We cannot assure you that we would be able to implement any of these alternative measures on satisfactory terms or at all or that the proceeds from such alternatives would be adequate to meet any debt or other obligations then due. If it becomes necessary to implement any of these alternative measures, our business, results of operations, or financial condition could be materially and adversely affected. Our partners, suppliers, vendors and we employ the services of writers, directors, actors and other talent as well as trade employees and others who are subject to collective bargaining agreements in the motion picture industry, both in the U.S. and internationally. If expiring collective bargaining agreements can not be renewed then it is possible that the affected unions could take action in the form of strikes or work stoppages. Such actions, as well as higher costs in connection with these collective bargaining agreements or a significant labor dispute, could have an adverse effect on our business by causing delays in production or by reducing profit margins. Preparing and forecasting our financial results requires us to make judgments and estimates which may differ materially from actual results. Given the dynamic nature of our business, and the inherent limitations in predicting the future, forecasts of our revenues, operating margins, net income and number of paid membership additions and other financial and operating data may differ materially from actual results. Such discrepancies could cause a decline in the trading price of our common stock. In addition, the preparation of consolidated financial statements in conformity with accounting principles generally accepted in the United States of America also requires management to make estimates and assumptions that affect the reported amounts of assets and liabilities, disclosures of contingent assets and liabilities at the date of the financial statements, and the reported amounts of revenues and expenses during the reported periods. We base such estimates on historical experience and on various other assumptions that we believe to be reasonable under the circumstances, but actual results may differ from these estimates. For example, we estimate the amortization pattern, beginning with the month of first availability, of any particular licensed or produced television series or movie based upon factors including historical and estimated viewing patterns. If we revise such estimates it could result in greater in-period expenses, which could cause us to miss our earnings guidance or negatively impact the results we report which could negatively impact our stock price. Our corporate headquarters are located in Los Gatos, California and consist of leased space aggregating approximately 600,000 square feet. Additionally, our Los Angeles, California offices consist of leased space aggregating approximately 400,000 square feet. We have entered into leases for additional space that will add approximately 700,000 square feet to the Los Angeles, California offices to support our growing headcount and growing number of original productions. The additional space is estimated to be available for use over the next two years. In the United States, we lease other offices in various locations, including Fremont, California for our DVD operations. We also lease office space in other countries to support international streaming operations. Information with respect to this item may be found in Note 5 Commitments and Contingencies in the accompanying notes to our consolidated financial statements included in Part II, Item 8, "Financial Statements and Supplementary Data" of this Annual Report on Form 10-K, under the caption "Legal Proceedings" which information is incorporated herein by reference. Our common stock is traded on the NASDAQ Global Select Market under the symbol “NFLX”. As of December 31, 2018, there were approximately 362 stockholders of record of our common stock, although there is a significantly larger number of beneficial owners of our common stock. The following graph compares, for the five year period ended December 31, 2018, the total cumulative stockholder return on the Company’s common stock, as adjusted for the seven-for-one stock split that occurred in July 2015, with the total cumulative return of the NASDAQ Composite Index, the S&P 500 Index and the RDG Internet Composite Index. Measurement points are the last trading day of each of the Company’s fiscal years ended December 31, 2013, December 31, 2014, December 31, 2015, December 31, 2016, December 31, 2017 and December 31, 2018. Total cumulative stockholder return assumes $100 invested at the beginning of the period in the Company’s common stock, the stocks represented in the NASDAQ Composite Index, the stocks represented in the S&P 500 Index and the stocks represented in the RDG Internet Composite Index, respectively, and reinvestment of any dividends. Historical stock price performance should not be relied upon as an indication of future stock price performance. The following selected consolidated financial data is not necessarily indicative of results of future operations and should be read in conjunction with Item 7, "Management’s Discussion and Analysis of Financial Condition and Results of Operations" and Item 8, "Financial Statements and Supplementary Data." The following amounts related to earnings per share and shares outstanding have been adjusted for the Company's seven-for-one stock split that occurred in July 2015. Free cash flow is defined as net cash provided by (used in) operating and investing activities, excluding the non-operational cash flows from purchases, maturities and sales of short-term investments. See Liquidity and Capital Resources in Item 7, "Management’s Discussion and Analysis of Financial Condition and Results of Operations" for a reconciliation of "free cash flow" to "net cash (used in) provided by operating activities." A paid membership (also referred to as a paid subscription) is defined as a membership that has the right to receive Netflix service following sign-up and a method of payment being provided, and that is not part of a free trial or other promotional offering by the Company to certain new and rejoining members. A membership is canceled and ceases to be reflected in the above metrics as of the effective cancellation date. Voluntary cancellations generally become effective at the end of the prepaid membership period. Involuntary cancellation of the service, as a result of a failed method of payment, becomes effective immediately. Memberships are assigned to territories based on the geographic location used at time of sign-up as determined by the Company’s internal systems, which utilize industry standard geo-location technology. Consolidated revenues for the year ended December 31, 2018 increased 35%, including an increase of 24% and 53% in revenues in the Domestic streaming and International streaming segments, respectively, as compared to the year ended December 31, 2017. International revenues accounted for 50% of total streaming revenue for the year ended December 31, 2018 as compared to 45% of total streaming revenues for the year ended December 31, 2017. The increase in consolidated revenues was primarily driven by the growth in the average number of streaming paid memberships globally, the majority of which was growth in our international memberships. Average paid international streaming memberships accounted for 55% of total average streaming paid memberships as of December 31, 2018, as compared to 49% of total average streaming paid memberships as of December 31, 2017. In addition, average monthly revenue per paying streaming membership increased primarily due to price changes and a shift in the plan mix towards higher priced plans. The growth in paid net membership additions has been less volatile when compared to growth in total net membership additions as a result of free trial variability. We therefore believe paid memberships is a more reliable indicator of revenue growth. The increase in operating margin is due primarily to increased revenues, partially offset by increased content expenses as we continue to acquire, license and produce content, including more Netflix originals, as well as increased marketing expenses and headcount costs to support continued improvements in our streaming service, our international expansion, and our growing content production activities. We offer three main types of streaming membership plans. Our "basic" plan includes access to standard definition quality streaming on a single screen at a time. Our "standard" plan is our most popular streaming plan and includes access to high definition quality streaming on two screens concurrently. Our "premium" plan includes access to high definition and ultra-high definition quality content on four screens concurrently. As of December 31, 2018, pricing on our plans ranged in the U.S. from $7.99 to $13.99 per month and internationally from the U.S. dollar equivalent of approximately $3 to $20 per month. We expect that from time to time the prices of our membership plans in each country may increase and we may occasionally test other plan and price variations. We define contribution profit (loss) as revenues less cost of revenues and marketing expenses incurred by the segment. This represents each segment's performance before global corporate costs. As markets within our International streaming segment become profitable, we increasingly focus on our global operating profit margin target as a measure of profitability. For the Domestic and International streaming segments, amortization of the streaming content assets makes up the majority of cost of revenues. Increasingly, we obtain multi-territory or global rights for our streaming content and allocate these rights between Domestic and International streaming segments based on estimated fair market value. Expenses associated with the acquisition, licensing and production of streaming content (such as payroll and related personnel expenses, costs associated with obtaining rights to music included in our content, overall deals with talent, miscellaneous production related costs and participations and residuals), streaming delivery costs and other operations costs, make up the remainder of cost of revenues. We have built our own global content delivery network ("Open Connect") to help us efficiently stream a high volume of content to our members over the internet. Streaming delivery expenses, therefore, include equipment costs related to Open Connect, payroll and related personnel expenses and all third-party costs, such as cloud computing costs, associated with delivering streaming content over the internet. Other operations costs include customer service and payment processing fees, including those we pay to our integrated payment partners, as well as other costs incurred in making our content available to members. For the Domestic and International streaming segments, marketing expenses consist primarily of advertising expenses and certain payments made to our marketing partners, including consumer electronics manufacturers, MVPDs, mobile operators and ISPs. Advertising expenses include promotional activities such as digital and television advertising. Marketing expenses also include payroll and related expenses for personnel that support the Company's marketing activities. Marketing expenses are incurred by our Domestic and International streaming segments in order to build consumer awareness of the streaming offerings, and in particular our original content. In the Domestic streaming segment, we derive revenues from monthly membership fees for services related to streaming content to our members in the United States. The 24% increase in our domestic streaming revenues was primarily due to the 11% growth in the average number of paid memberships, as well as a 12% increase in average monthly revenue per paying membership, resulting from our price changes and a shift in the plan mix towards higher priced plans. Our standard plan continues to be the most popular plan choice for new memberships. The increase in domestic streaming cost of revenues was primarily due to a $358 million increase in content amortization relating to our existing and new streaming content, including more exclusive and original programming. Other costs increased $210 million primarily due to increases in expenses associated with the acquisition, licensing and production of streaming content as well as increased payment processing fees driven by our growing member base. Domestic marketing expenses increased primarily due to an increase in advertising, driven by increased investments in marketing of new original titles. The increase in marketing expenses is also attributable to increased public relations spending and payments to our partners. The increase in our domestic streaming revenues was primarily due to a 10% growth in the average number of paid memberships and an 11% increase in average monthly revenue per paying membership. The increase in average monthly revenue per paying membership resulted from our price changes and plan mix. The increase in domestic streaming cost of revenues was primarily due to a $419 million increase in content amortization relating to our existing and new streaming content, including more exclusive and original programming. In addition, we had a $100 million increase in other costs, such as payment processing fees and customer service call centers, due to our growing member base. Domestic marketing expenses increased primarily due to an increase in advertising and public relations spending, as well as increased payments to our partners. In the International streaming segment, we derive revenues from monthly membership fees for services related to streaming content to our members outside the United States. The 53% increase in our international revenues was due to the 40% growth in the average number of paid international memberships, in addition to a 9% increase in average monthly revenue per paying membership. The increase in average monthly revenue per paying membership was due to price changes and a shift in the plan mix towards higher priced plans, partially offset by unfavorable fluctuations in foreign exchange rates. We estimate that international revenues would have been approximately $94 million higher in the year ended December 31, 2018 if foreign exchange rates had remained consistent with those for the year ended December 31, 2017. If foreign currency exchange rates fluctuate more than expected, revenues and average revenue per paying membership may differ from our expectations. The increase in international cost of revenues was primarily due to a $976 million increase in content amortization relating to our existing and new streaming content, including more exclusive and original programming. Other costs increased $440 million primarily due to increases in expenses associated with the acquisition, licensing and production of streaming content, coupled with increases in payment processing fees and streaming delivery expenses, which were driven by our growing member base. International marketing expenses increased primarily due to increased advertising, driven by increased investments in marketing of new original titles. The increase in marketing expenses is also attributable to increased payments to our partners. The increase in our international revenues was due to the 43% growth in the average number of paid international memberships and an 11% increase in average monthly revenue per paying membership. The increase in average monthly revenue per paying membership resulted from our price changes and plan mix, coupled with favorable fluctuations in foreign exchange rates. We estimate that international revenues would have been approximately $22 million lower in the year ended December 31, 2017 if foreign exchange rates had remained consistent with those for the year ended December 31, 2016. The increase in international cost of revenues was primarily due to a $990 million increase in content amortization relating to our existing and new streaming content, including more exclusive and original programming. Other costs increased $327 million primarily due to increases in our streaming delivery expenses, costs associated with our customer service call centers and payment processing fees, all driven by our growing member base, partially offset by decreases resulting from exchange rate fluctuations. International marketing expenses increased primarily due to increased advertising and public relations, as well as increased payments to our partners. In the Domestic DVD segment, we derive revenues from our DVD-by-mail membership services. We offer various DVD-by-mail plans that differ by the number of DVDs that a member may have out at any given point and access to high definition Blu-ray discs in addition to standard definition DVDs. Cost of revenues in the Domestic DVD segment consist primarily of delivery expenses such as packaging and postage costs, content expenses, and other expenses associated with our DVD processing and customer service centers. The number of memberships to our DVD-by-mail offering is declining, and we anticipate that this decline will continue. Technology and development expenses consist of payroll and related expenses for all technology personnel, as well as other costs incurred in making improvements to our service offerings, including testing, maintaining and modifying our user interface, our recommendation, merchandising and streaming delivery technology and infrastructure. Technology and development expenses also include costs associated with computer hardware and software. The increase in technology and development expenses was primarily due to a $218 million increase in personnel-related costs, including stock-based compensation expense, resulting from an increase in compensation for existing employees and growth in average headcount supporting continued improvements in our streaming service and our international expansion. The increase in technology and development expenses was primarily due to a $120 million increase in personnel-related costs, including stock-based compensation expense, resulting from an increase in compensation for existing employees and growth in average headcount supporting continued improvements in our streaming service and our international expansion. In addition, third-party expenses, including costs associated with cloud computing, increased $25 million and facilities-related costs increased $24 million, primarily driven by costs for our expanded Los Gatos, California headquarters. General and administrative expenses consist of payroll and related expenses for corporate personnel. General and administrative expenses also includes professional fees and other general corporate expenses. General and administrative expenses increased primarily due to a $147 million increase in personnel-related costs, including stock-based compensation expense, resulting from an increase in compensation for existing employees and growth in average headcount supporting continued improvements in our streaming service and our international expansion. In addition, third-party expenses, including costs for contractors and consultants, increased $29 million. General and administrative expenses increased primarily due to a $77 million increase in personnel-related costs, including stock-based compensation expense, resulting from an increase in compensation for existing employees and growth in average headcount supporting continued improvements in our streaming service and our international expansion. In addition, third-party expenses, including costs for contractors and consultants, increased $16 million. Interest expense consists primarily of the interest associated with our outstanding long-term debt obligations, including the amortization of debt issuance costs, as well as interest on our lease financing obligations. See Note 4 Long-term Debt in the accompanying notes to our consolidated financial statements included in Part II, Item 8, "Financial Statements and Supplementary Data" of this Annual Report on Form 10-K for further detail of our long-term debt obligations. Interest expense for the year ended December 31, 2018 consists primarily of $409 million of interest on our Notes. The increase in interest expense for the year ended December 31, 2018 as compared to the year ended December 31, 2017 is due to the increase in long-term debt. Interest expense for the year ended December 31, 2017 consists primarily of $229 million of interest on our Notes. The increase in interest expense for the year ended December 31, 2017 as compared to the year ended December 31, 2016 is due to the increase in long-term debt. Interest and other income (expense) increased primarily due to lower foreign exchange losses. The foreign exchange loss of $1 million in the year ended December 31, 2018 was primarily driven by the remeasurement of cash and content liability positions in currencies other than the functional currencies of our European and U.S. entities, mostly offset by the $74 million gain from remeasurement of our Senior Notes denominated in euros. Interest and other income (expense) decreased primarily due to foreign exchange losses. In the year ended December 31, 2017, the foreign exchange loss of $128 million was primarily driven by the $141 million loss from remeasurement of our €1,300 million Senior Notes, partially offset by the remeasurement of cash and content liability positions in currencies other than functional currencies of our European and U.S. entities. The increase in our effective tax rate is mainly due to lower benefit on a percentage basis from the recognition of excess tax benefits of stock-based compensation as well as additional expense related to foreign taxes, nondeductible expenses and the international provisions from the U.S. tax reform enacted in December 2017. In 2018, the difference between our 1% effective tax rate and the Federal statutory rate of 21% was primarily due to the recognition of excess tax benefits of stock-based compensation, Federal and California research and development credits (“R&D”), and updated adjustments related to U.S. tax reform as a result of the U.S. federal tax return filing, partially offset by state taxes, foreign taxes, non-deductible expenses and the international provisions from the U.S. tax reform enacted in December 2017. On December 22, 2017, the Tax Cuts and Jobs Act of 2017 (the “Act”) was signed into law making significant changes to the Internal Revenue Code. Changes include, but are not limited to, a corporate tax rate decrease from 35% to 21% effective for tax years beginning after December 31, 2017, the transition of U.S. international taxation from a worldwide tax system to a territorial system, and a one-time transition tax on the mandatory deemed repatriation of cumulative foreign earnings as of December 31, 2017. In accordance with the Act, we recorded $79 million as additional income tax expense in the fourth quarter of 2017, the period in which the legislation was enacted. The total expense included $32 million related to the transition tax and $47 million related to the remeasurement of certain deferred tax assets and liabilities. Additionally, Staff Accounting Bulletin No. 118 ("SAB 118") was issued to address the application of U.S. GAAP in situations when a registrant does not have the necessary information available, prepared, or analyzed (including computations) in reasonable detail to complete the accounting for certain income tax effects of the Act. December 22, 2018 marked the end of the measurement period for purposes of SAB 118. As such, we have completed our analysis based on legislative updates relating to the Act currently available which resulted in an additional SAB 118 tax benefit of $34 million in the fourth quarter of 2018 and a total tax benefit of $72 million for the year ended December 31, 2018. The total tax provision benefit included $45 million related to adjustments to the transition tax and a $27 million benefit related to the remeasurement of certain deferred tax assets and liabilities. At the beginning of 2017, we underwent a corporate restructuring that better aligns our corporate structure with how our business operates. As a result of this restructuring and our increasing international income, there is now significantly more income being taxed at rates lower than the U.S. tax rate. The decrease in our effective tax rate is mainly due to the recognition of excess tax benefits attributable to the adoption of ASU 2016-09 and an increase in foreign income taxed at rates lower than the U.S. statutory rate. In 2017, the difference between our (15)% effective tax rate and the Federal statutory rate of 35% was $(244) million primarily due to the recognition of excess tax benefits as a component of the provision for income taxes, an increase in foreign income taxed at rates lower than the U.S. statutory rate and Federal and California research and development credits (“R&D”), partially offset by state taxes and non-deductible expenses as well as the provisional impact of changes to tax law. On December 22, 2017, the Tax Cuts and Jobs Act of 2017 (the “Act”) was signed into law making significant changes to the Internal Revenue Code. Changes include, but are not limited to, a corporate tax rate decrease from 35% to 21% effective for tax years beginning after December 31, 2017, the transition of U.S international taxation from a worldwide tax system to a territorial system, and a one-time transition tax on the mandatory deemed repatriation of cumulative foreign earnings as of December 31, 2017. We have calculated our best estimate of the impact of the Act in our year end income tax provision in accordance with our understanding of the Act and guidance available as of the date of this filing and as a result have recorded $79 million as additional income tax expense in the fourth quarter of 2017, the period in which the legislation was enacted. The provisional amount related to the remeasurement of certain deferred tax assets and liabilities, based on the rates at which they are expected to reverse in the future, was $47 million. The provisional amount related to the one-time transition tax on the mandatory deemed repatriation of foreign earnings was $32 million based on cumulative foreign earnings of $485 million. We also recorded a $67 million benefit related to foreign taxes expensed in prior years that may now be claimed as a Foreign Tax Credit. We have determined there is sufficient foreign source income projected to utilize these credits. Cash, cash equivalents and restricted cash increased $989 million in the year ended December 31, 2018 primarily due to the issuance of debt, partially offset by cash used in operations. Long-term debt, net of debt issuance costs, increased $3,861 million due to long-term note issuances of $1,900 million in April 2018 and $800 million and €1,100 million in October 2018. The earliest maturity date for our outstanding long-term debt is February 2021. As of December 31, 2018, no amounts had been borrowed under our $500 million revolving credit facility. See Note 4 Long-term Debt in the accompanying notes to our consolidated financial statements. We anticipate continuing to finance our future capital needs in the debt market, as we continue to believe that our after-tax cost of debt is lower than our cost of equity. Our ability to obtain this or any additional financing that we may choose to, or need to, obtain will depend on, among other things, our development efforts, business plans, operating performance and the condition of the capital markets at the time we seek financing. We may not be able to obtain such financing on terms acceptable to us or at all. If we raise additional funds through the issuance of equity or debt securities, those securities may have rights, preferences or privileges senior to the rights of our common stock, and our stockholders may experience dilution. Our primary uses of cash include the acquisition, licensing and production of content, streaming delivery, marketing programs and personnel-related costs. Cash payment terms for non-original content have historically been in line with the amortization period. Investments in original content, and in particular content that we produce and own, require more cash upfront relative to licensed content. For example, production costs are paid as the content is created, well in advance of when the content is available on the service and amortized. We expect to continue to significantly increase our investments in global streaming content, particularly in original content, which will impact our liquidity and result in future negative free cash flows for many years. We currently anticipate that cash flows from operations, available funds and access to financing sources, including our revolving credit facility, will continue to be sufficient to meet our cash needs for at least the next twelve months. We define free cash flow as cash provided by (used in) operating and investing activities excluding the non-operational cash flows from purchases, maturities and sales of short-term investments. We believe free cash flow is an important liquidity metric because it measures, during a given period, the amount of cash generated that is available to repay debt obligations, make investments and for certain other activities or the amount of cash used in operations, including investments in global streaming content. Free cash flow is considered a non-GAAP financial measure and should not be considered in isolation of, or as a substitute for, net income, operating income, cash flow used in operating activities, or any other measure of financial performance or liquidity presented in accordance with GAAP. In assessing liquidity in relation to our results of operations, we compare free cash flow to net income, noting that the three major recurring differences are excess content payments over amortization, non-cash stock-based compensation expense and other working capital differences. Working capital differences include deferred revenue, taxes and semi-annual interest payments on our outstanding debt. Our receivables from members generally settle quickly and deferred revenue is a source of cash flow. Net cash used in operating activities increased $895 million to $2,680 million for the year ended December 31, 2018. The increased use of cash was primarily driven by the increase in investments in streaming content that require more upfront payments, partially offset by a $4,102 million or 35% increase in revenues. The payments for streaming content assets increased $3,138 million, from $8,906 million to $12,044 million, or 35%, as compared to the increase in the amortization of streaming content assets of $1,334 million, from $6,198 million to $7,532 million, or 22%. In addition, we had increased payments associated with higher operating expenses, primarily related to increased headcount to support our continued improvements in our streaming service, our international expansion and increased content production activities. Net cash used in investing activities increased $373 million, primarily due to the decrease in proceeds from the sale of short-term investments, net of purchases, of $268 million. In July 2017, the Company sold all short-term investments. In addition, the cash used to purchase other assets increased $120 million primarily driven by the acquisition of intangible assets in the year ended December 31, 2018. Net cash provided by financing activities increased $972 million due to an increase in the proceeds from the issuance of debt of $938 million from $2,988 million in the year ended December 31, 2017 to $3,926 million in the year ended December 31, 2018. In addition, we had an increase in the proceeds from the issuance of common stock of $36 million. Non-GAAP free cash flow was $4,231 million lower than net income for the year ended December 31, 2018 primarily due to $4,512 million of cash payments for streaming content assets over streaming amortization expense and $40 million in other non-favorable working capital differences, partially offset by $321 million of non-cash stock-based compensation expense. Net cash used in operating activities increased $312 million to $1,786 million for the year ended December 31, 2017. The increased use of cash was primarily driven by the increase in investments in streaming content that require more upfront payments, partially offset by a $2,862 million or 32% increase in revenues. The payments for streaming content assets increased $2,025 million, from $6,881 million to $8,906 million, or 29%, as compared to an increase in the amortization of streaming content assets of $1,409 million, from $4,788 million to $6,198 million, or 29%. In addition, we had increased payments associated with higher operating expenses, primarily related to increased headcount costs to support our continued improvements in our streaming service, our international expansion and increased content production activities. The increased use of cash was partially offset by a $2,862 million or 32% increase in revenues. Net cash provided by investing activities decreased $15 million, primarily due to a $66 million increase in the purchases of property and equipment, largely due to the expansion of our Los Gatos, California headquarters, as well as our new office space in Los Angeles, California. This increase in cash used was partially offset by an increase of $33 million in the proceeds from sales and maturities of short-term investments, net of purchases due to the sale of our short-term investments in July 2017 as well as a decline in DVD purchases of $24 million. Net cash provided by financing activities increased $1,985 million due to an increase in the proceeds from the issuance of debt of $1,999 million from $989 million in the year ended December 31, 2016 to $2,988 million in the year ended December 31, 2017. Non-GAAP free cash flow was $2,579 million lower than net income for the year ended December 31, 2017 primarily due to $2,708 million of cash payments for streaming content assets over streaming amortization expense and $53 million of unfavorable other working capital differences, partially offset by $182 million of non-cash stock-based compensation expense. As of December 31, 2018, streaming content obligations were comprised of $4.7 billion included in "Current content liabilities" and $3.8 billion of "Non-current content liabilities" on the Consolidated Balance Sheets and $10.8 billion of obligations that are not reflected on the Consolidated Balance Sheets as they did not then meet the criteria for recognition. Streaming content obligations increased $1.6 billion from $17.7 billion as of December 31, 2017 to $19.3 billion as of December 31, 2018 primarily due to multi-year commitments associated with the continued expansion of our exclusive and original programming. Streaming content obligations include amounts related to the acquisition, licensing and production of streaming content. An obligation for the production of content includes non-cancelable commitments under creative talent and employment agreements and other production related commitments. An obligation for the acquisition and licensing of content is incurred at the time we enter into an agreement to obtain future titles. Once a title becomes available, a content liability is recorded on the Consolidated Balance Sheets. Certain agreements include the obligation to license rights for unknown future titles, the ultimate quantity and/or fees for which are not yet determinable as of the reporting date. Traditional film output deals, or certain TV series license agreements where the number of seasons to be aired is unknown, are examples of these types of agreements. The contractual obligations table above does not include any estimated obligation for the unknown future titles, payment for which could range from less than one year to more than five years. However, these unknown obligations are expected to be significant and we believe could include approximately $2 billion to $5 billion over the next three years, with the payments for the vast majority of such amounts expected to occur after the next twelve months. The foregoing range is based on considerable management judgments and the actual amounts may differ. Once we know the title that we will receive and the license fees, we include the amount in the contractual obligations table above. Long-term debt obligations include our Notes consisting of principal and interest payments. See Note 4 Long-term Debt in the accompanying notes to our consolidated financial statements included in Part II, Item 8, "Financial Statements and Supplementary Data" of this Annual Report on Form 10-K for further details. as of December 31, 2017 to $1,708 million as of December 31, 2018 due to growth in facilities to support our growing headcount and growing number of original productions. Other purchase obligations include all other non-cancelable contractual obligations. These contracts are primarily related to streaming delivery and cloud computing costs, as well as other miscellaneous open purchase orders for which we have not received the related services or goods. As of December 31, 2018, we had gross unrecognized tax benefits of $48 million which was classified in “Other non-current liabilities” and a reduction to deferred tax assets which was classified as "Other non-current assets" in the consolidated balance sheets. At this time, an estimate of the range of reasonably possible adjustments to the balance of unrecognized tax benefits cannot be made. The information set forth under Note 6 Guarantees - Indemnification Obligations in the accompanying notes to our consolidated financial statements included in Part II, Item 8, "Financial Statements and Supplementary Data" of this Annual Report on Form 10-K is incorporated herein by reference. We acquire, license and produce content, including original programing, in order to offer our members unlimited viewing of TV series and films. The content licenses are for a fixed fee and specific windows of availability. Payment terms for certain content licenses and the production of content require more upfront cash payments relative to the amortization expense. Payments for content, including additions to streaming assets and the changes in related liabilities, are classified within "Net cash used in operating activities" on the Consolidated Statements of Cash Flows. For licenses, we capitalize the fee per title and record a corresponding liability at the gross amount of the liability when the license period begins, the cost of the title is known and the title is accepted and available for streaming. The portion available for streaming within one year is recognized as “Current content assets, net” and the remaining portion as “Non-current content assets, net” on the Consolidated Balance Sheets. For productions, we capitalize costs associated with the production, including development cost, direct costs and production overhead. We include these amounts in "Non-current content assets, net" on the Consolidated Balance Sheets. Participations and residuals are expensed in line with the amortization of production costs. Based on factors including historical and estimated viewing patterns, we amortize the content assets (licensed and produced) in “Cost of revenues” on the Consolidated Statements of Operations over the shorter of each title's contractual window of availability or estimated period of use or ten years, beginning with the month of first availability. The amortization is on an accelerated basis, as we typically expect more upfront viewing, for instance due to additional merchandising and marketing efforts, and film amortization is more accelerated than TV series amortization. We review factors that impact the amortization of the content assets on an ongoing basis. Our estimates related to these factors require considerable management judgment. Our business model is subscription based as opposed to a model generating revenues at a specific title level. Therefore, content assets, both licensed and produced, are reviewed in aggregate at the operating segment level when an event or change in circumstances indicates a change in the expected usefulness of the content asset. To date, we have not identified any such event or changes in circumstances. If such changes are identified in the future, these aggregated content assets will be stated at the lower of unamortized cost, net realizable value or fair value. In addition, unamortized costs for assets that have been, or are expected to be, abandoned are written off. In evaluating our ability to recover our deferred tax assets, in full or in part, we consider all available positive and negative evidence, including our past operating results, and our forecast of future earnings, future taxable income and prudent and feasible tax planning strategies. The assumptions utilized in determining future taxable income require significant judgment and are consistent with the plans and estimates we are using to manage the underlying businesses. Actual operating results in future years could differ from our current assumptions, judgments and estimates. However, we believe that it is more likely than not that most of the deferred tax assets recorded on our Consolidated Balance Sheets will ultimately be realized. We record a valuation allowance to reduce our deferred tax assets to the net amount that we believe is more likely than not to be realized. At December 31, 2018 the valuation allowance of $125 million was primarily related to foreign tax credits that we are not expected to realize. We did not recognize certain tax benefits from uncertain tax positions within the provision for income taxes. We may recognize a tax benefit only if it is more likely than not the tax position will be sustained on examination by the taxing authorities, based on the technical merits of the position. The tax benefits recognized in the financial statements from such positions are then measured based on the largest benefit that has a greater than 50% likelihood of being realized upon settlement. At December 31, 2018, our estimated gross unrecognized tax benefits were $48 million of which $44 million, if recognized, would favorably impact our future earnings. Due to uncertainties in any tax audit outcome, our estimates of the ultimate settlement of our unrecognized tax positions may change and the actual tax benefits may differ significantly from the estimates. On December 22, 2017, the Tax Cuts and Jobs Act of 2017 (the “Act”) was signed into law making significant changes to the Internal Revenue Code. Changes include, but are not limited to, a corporate tax rate decrease from 35% to 21% effective for tax years beginning after December 31, 2017, the transition of U.S international taxation from a worldwide tax system to a territorial system, and a one-time transition tax on the mandatory deemed repatriation of cumulative foreign earnings as of December 31, 2017. In accordance with the Act, we recorded $79 million as additional income tax expense in the fourth quarter of 2017, the period in which the legislation was enacted. The total expense included $32 million related to the transition tax and $47 million related to the remeasurement of certain deferred tax assets and liabilities. Additionally, Staff Accounting Bulletin No. 118 ("SAB 118") was issued to address the application of U.S. GAAP in situations when a registrant does not have the necessary information available, prepared, or analyzed (including computations) in reasonable detail to complete the accounting for certain income tax effects of the Act. December 22, 2018 marked the end of the measurement period for purposes of SAB 118. As such, we have completed our analysis based on legislative updates relating to the Act currently available which resulted in an additional SAB 118 tax benefit of $34 million in the fourth quarter of 2018 and a total tax benefit of $72 million for the year ended December 31, 2018. The total tax provision benefit included $45 million related to adjustments to the transition tax and a $27 million benefit related to the remeasurement of certain deferred tax assets and liabilities. See Note 9 to the consolidated financial statements for further information regarding income taxes. We are exposed to market risks related to interest rate changes and the corresponding changes in the market values of our debt and foreign currency fluctuations. In July 2017, we sold all short-term investments. At December 31, 2018, our cash equivalents were generally invested in money market funds, which are not subject to market risk because the interest paid on such funds fluctuates with the prevailing interest rate. As of December 31, 2018, we had $10.4 billion of debt, consisting of fixed rate unsecured debt in ten tranches due between 2021 and 2029. Refer to Note 4 to the consolidated financial statements for details about all issuances. The fair value of our debt will fluctuate with movements of interest rates, increasing in periods of declining rates of interest and declining in periods of increasing rates of interest. The fair value of our debt will also fluctuate based on changes in foreign currency rates, as discussed below. International revenues and cost of revenues account for 49% and 58%, respectively, of consolidated amounts for the year ended December 31, 2018. The majority of international revenues and a smaller portion of expenses are denominated in currencies other than the U.S. dollar and we therefore have foreign currency risk related to these currencies, which are primarily the euro, the British pound, the Canadian dollar, the Australian dollar, the Japanese yen, the Mexican peso and the Brazilian real. Accordingly, changes in exchange rates, and in particular a weakening of foreign currencies relative to the U.S. dollar may negatively affect our revenue and contribution profit (loss) of our International streaming segment as expressed in U.S. dollars. For the year ended December 31, 2018, we believe our international revenues would have been approximately $94 million higher had foreign currency exchange rates remained consistent with those for the year ended December 31, 2017. We have also experienced and will continue to experience fluctuations in our net income as a result of gains (losses) on the settlement and the remeasurement of monetary assets and liabilities denominated in currencies that are not the functional currency. In the year ended December 31, 2018, we recognized a $1 million foreign exchange loss due to the remeasurement of significant content liabilities denominated in currencies other than functional currencies of our European and U.S. entities, mostly offset by the remeasurement of our Senior Notes denominated in euros. In addition, the effect of exchange rate changes on cash and cash equivalents in the year ended December 31, 2018 was a decrease of $40 million. Our management is responsible for establishing and maintaining adequate internal control over financial reporting (as defined in Rule 13a-15(f) of the Securities Exchange Act of 1934 as amended (the Exchange Act)). Our management assessed the effectiveness of our internal control over financial reporting as of December 31, 2018. In making this assessment, our management used the criteria set forth by the Committee of Sponsoring Organizations of the Treadway Commission (“COSO”) in Internal Control—Integrated Framework (2013 framework). Based on our assessment under the framework in Internal Control—Integrated Framework (2013 framework), our management concluded that our internal control over financial reporting was effective as of December 31, 2018. The effectiveness of our internal control over financial reporting as of December 31, 2018 has been audited by Ernst & Young LLP, an independent registered public accounting firm, as stated in their report that is included herein. There was no change in our internal control over financial reporting that occurred during the quarter ended December 31, 2018 that has materially affected, or is reasonably likely to materially affect, our internal control over financial reporting. 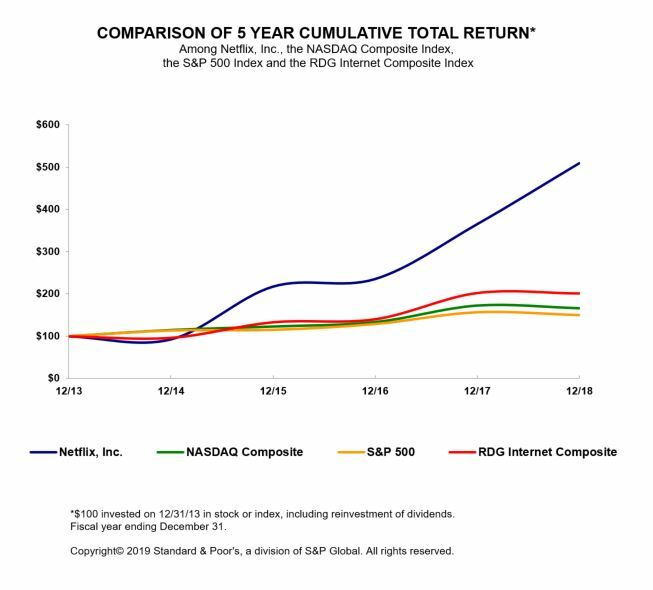 To the stockholders and the Board of Directors of Netflix, Inc.
We have audited Netflix, Inc.’s internal control over financial reporting as of December 31, 2018, based on criteria established in Internal Control - Integrated Framework issued by the Committee of Sponsoring Organizations of the Treadway Commission (2013 framework) (the COSO criteria). In our opinion, Netflix, Inc. (the Company) maintained, in all material respects, effective internal control over financial reporting as of December 31, 2018, based on the COSO criteria. We also have audited, in accordance with the standards of the Public Company Accounting Oversight Board (United States) (PCAOB), the consolidated balance sheets of the Company as of December 31, 2018 and 2017, the related consolidated statements of operations, comprehensive income, stockholders’ equity and cash flows for each of the three years in the period ended December 31, 2018 and the related notes and our report dated January 29, 2019 expressed an unqualified opinion thereon. We have audited the accompanying consolidated balance sheets of Netflix, Inc. (the Company) as of December 31, 2018 and 2017, the related consolidated statements of operations, comprehensive income, stockholders’ equity and cash flows for each of the three years in the period ended December 31, 2018, and the related notes (collectively referred to as the “consolidated financial statements"). In our opinion, the consolidated financial statements present fairly, in all material respects, the financial position of the Company at December 31, 2018 and 2017, and the results of its operations and its cash flows for each of the three years in the period ended December 31, 2018, in conformity with U.S. generally accepted accounting principles. We also have audited, in accordance with the standards of the Public Company Accounting Oversight Board (United States) (PCAOB), the Company’s internal control over financial reporting as of December 31, 2018, based on criteria established in Internal Control - Integrated Framework issued by the Committee of Sponsoring Organizations of the Treadway Commission (2013 framework) and our report dated January 29, 2019 expressed an unqualified opinion thereon.